Welcome to Carleton University, Canada’s Capital University! 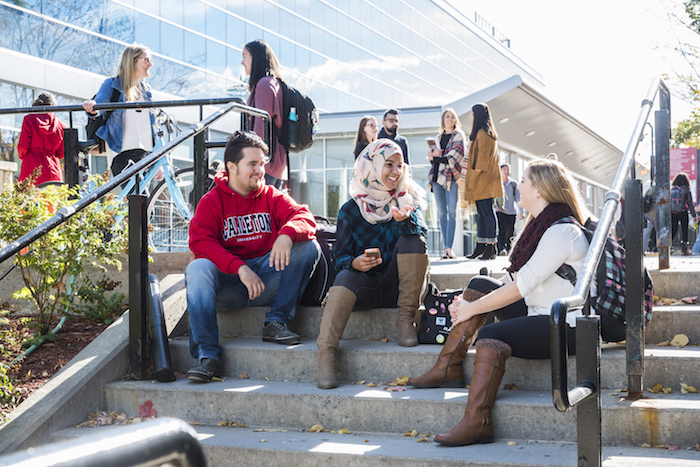 Carleton University provides high-quality education to more than 24,000 full- and part-time students at the undergraduate and graduate levels. We draw students from more than 140 countries to our diverse and inclusive campus, and have over 153,000 alumni living in over 160 countries around the world. Our 22 undergraduate degree programs—with over 100 majors, concentrations and specializations—provide the skills and knowledge to solve real-world problems. Carleton's 875+ academic staff are recognized internationally for their scholarship and cutting-edge research in more than 50 disciplines. Carleton students benefit from the interdisciplinary, active, hands-on approach to teaching and research practiced by faculty members and from the numerous partnerships the university has with the federal government, other universities, and private sector partners. Our campus and city provide a beautiful and welcoming environment in which to live and study. 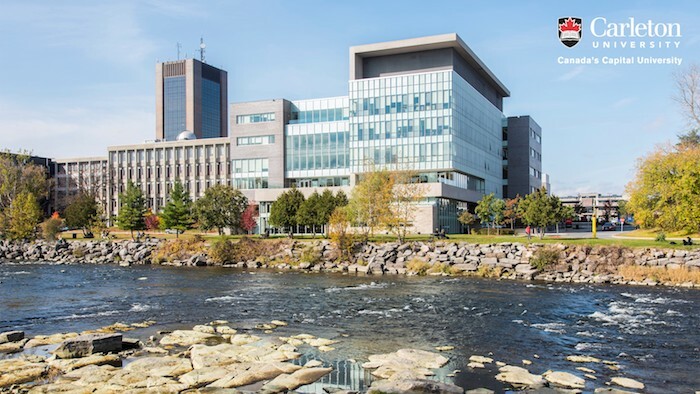 The campus is situated just south of Ottawa’s city centre, and is bordered by the Rideau River, the historic Rideau Canal, and pleasant residential neighbourhoods. Our location in the nation’s capital gives you access to incredible off-campus resources such as government facilities, museums and archives, foreign embassies, medical and life sciences research labs, and a thriving high-tech industry. Come and be a part of this extraordinary university! Carleton’s proximity to government institutions, libraries, media and a thriving knowledge economy make Carleton a great place to learn and live. Students, staff, faculty and visitors to Carleton University can take advantage of what Ottawa has to offer all year round: the arts, the outdoors, professional sports, and an exciting, vibrant night life and a strong sense of community. Carleton University is close to Canada’s majestic Parliament Buildings, the bustling Byward Market, and the beautiful Gatineau Park. The majority of Carleton’s undergraduate programs include work-study opportunities. Carleton co-op students have worked with many employers including: Blackberry, Bombardier Aerospace, Canada Revenue Agency, Environment and Climate Change Canada, Ericsson, Hydro Ottawa, IBM Canada, National Research Council, Nokia, Ross Video, Scotiabank and more. After graduating from a degree program, international students can apply for a work permit to remain in Canada for up to three years to gain work experience. Carleton is home to an extensive network of more than 200 active clubs and societies - a great way to meet new people, gain valuable skills, and pursue your interests outside of the classroom. Carleton’s Bachelor of Architectural Studies focuses on knowledge, experience, creativity and imagination. Our program encourages you to explore ideas through making, evaluate ideas within the context of the human experience, and exercise creativity through writing, model making, drawing, digital media and presentations. Cognitive science involves the study of cognition, perception, and emotion from a wide range of perspectives. Despite the many different methodologies they use, cognitive scientists are united in their interest in the mind—and the brain. Researchers in our program (students and faculty members) study the mind by combining the methods and theories of five disciplines: psychology, philosophy, linguistics, neuroscience and computer science. This interdisciplinary approach allows unique insights into human understanding, thought, perception, language and emotion. We live in a media society, but what exactly does this mean? How does a world saturated by media images, technologies and texts influence how we live and work? How is the ever-changing mediascape affecting our understanding of society and our ability to shape its future? These are some of the fundamental questions that a degree in Communication and Media Studies (BCoMS) will help you to answer. Computers and computer systems play a central role in business, communication, science, entertainment and medicine. As the range of computer applications continues to expand, so does the demand for computer scientists. Computer Science is an ever-changing discipline that studies the theory, design and implementation of computer applications and systems. You will learn to use computing and information technology to help solve the problems that we face in business, science and society today and those that we will face tomorrow. The Honors Computer Science program at Carleton is organized into diverse streams so that you can develop particular expertise. Economics may be a specialized area of knowledge, but it is relevant to almost every aspect of our lives. At its core, it is the study of reasoned choice in the context of scarce resources and competing interests. The need to make such choices pervades the day-to-day lives of all of us—as individuals and in society as a whole. Carleton’s Bachelor of Global and International Studies (BGInS) program takes advantage of Carleton’s strengths and location to provide undergraduate education in global and international issues that can give you an advantage in today’s job market. The program has four interconnected components. The core course sequence provides all students with a common multidisciplinary foundation in global and international studies. The 18 specializations cover specific international and global themes or geographical areas, giving you the opportunity to focus your studies according to your interests. In the Bachelor of Humanities, students read the world’s most influential books and explore the world’s most exciting ideas in art, philosophy, history, literature, classics, music, religion and science. In this interdisciplinary Liberal Arts program, students study the world’s greatest ideas, books, and artworks produced by thinkers from the span of recorded world history— from ancient Mesopotamia to modern America. The emphasis of the program is on ideas, explored through small discussion groups and writing assignments. The typical Humanities student loves to read, and is excited about sharing ideas with students and professors. Industrial designers are responsible for the concept, the design and the details that are worked out before the manufacturing process of any product can begin. They work behind the scenes to determine the features, appearance, materials and ergonomics of the many products—from toasters to cell phones—that we use every day. The world of information technology is always evolving. What is now commonplace was once a breakthrough. As a student in one of the Bachelor of Information Technology programs, you will acquire the theoretical knowledge and practical skills needed to address the IT issues of today and the possibilities of tomorrow. The Sprott School of Business offers a Bachelor of International Business which is recognized as a leading program in international business education. With a focus on international business, you will develop cross-cultural skills, become proficient in another language and study abroad for a year in a country where that language is spoken. The Bachelor of International Business delivers a unique business education that is truly international. The Sprott School of Business also offers a separate Bachelor of Commerce degree program. Mathematics is a driving force behind many of today’s advancements in medicine, economics and business, and science and technology. As a Bachelor of Mathematics student, you can choose from a broad range of program options according to your interests and career goals. The solid mathematical knowledge and skills you acquire at Carleton will give you a competitive edge in a wide variety of careers and prepare you to contribute to the next generation of innovations. Whether you are an aspiring performer, a budding critic curious about how music shapes culture, or a talented musician who wants to share the joys of musicianship as a teacher, Carleton’s Bachelor of Music will prepare you to achieve your goals. Experimenting is a key component of learning science at Carleton. In the first year, your classes will typically have a lecture and a lab or tutorial component. Each lab will take three hours per week, so if you choose three of these lab courses, you could have nine hours of hands-on experimentation every week. Our labs, tutorials, field courses and seminars are conducted in small classes, resulting in plenty of personalized interactions with professors, lab supervisors and fellow students.